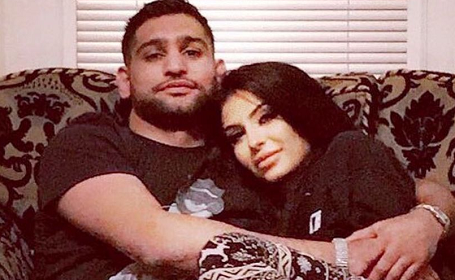 Amir Khan and Faryal Makhdoom have confirmed they are back together after a very bitter break-up. The boxing champ shared a sweet snap of the pair embracing this afternoon, with the caption: "With my 4 month pregnant wife, after sorting out all the issues. Closing the year with a happy ending." He ended the tweet with a prayer emoji. The adorable picture of the pair shows them snuggling on a sofa, with pregnant Faryal wearing festive woolly leggings and leaning into her husband. The reconciliation follows weeks of explosive, high-profile drama.